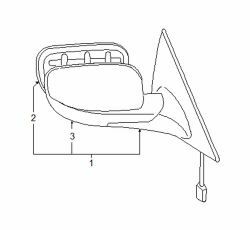 Item 1 in the assembly drawing image on this page corresponds to Mazda OEM part number FE01-69-120G-PZ. This Mazda RX-8 Right Mirror assy is a 100% genuine OEM replacement part shipped directly to you from our Mazda dealership. Genuine Mazda replacement parts are backed by the manufacturer's warranty. And that's all we sell on this website, all at discount pricing. PARTS: Part included with mirror assembly. Order by color and description. PARTS: Part included with mirror assembly.